Apple has released Mountain Lion (OS X 10.8), and while we’ve got a full review to read, those looking to install the new OS also have more-practical matters: Getting their Macs ready for Mountain Lion. As with Lion (OS X 10.7) last year, Apple is advertising Mountain Lion as dead-simple to install. But as with every major upgrade to OS X, there are a few things you can do before upgrading to ensure that your Mac is ready to go. Apple also says you need 2GB of RAM (memory), although in my experience, you’ll enjoy better results with at least 4GB. If you have only 2GB installed, you might consider a hardware upgrade before installing OS X 10.8. A word of advice here: If you don’t buy your RAM directly from Apple, be sure you get RAM that’s specifically guaranteed for use in Macs. Some third-party RAM that’s not up to Apple’s specs will cause problems when you upgrade your OS. Most reputable vendors will make it clear which RAM they offer is specifically compatible with Macs. Similarly, Apple recommends having at least 8GB of free space on your Mac’s drive, but I recommend playing it safe by aiming for 15GB or more—the Mountain Lion installer itself is over 4GB and you'll need some room for temporary files. You may also find, especially if you’re upgrading from Snow Leopard, that some of Mountain Lion’s features require more “everyday” free space, as is the case in Lion. If you need to free up space on your drive, you can use a utility such as WhatSize or GrandPerspective to help you find big files you can get rid of; and we recently provided some specific suggestions for freeing up drive space. In Lion, you can check your Mac's specs using the About This Mac window (left); Snow Leopard users can use Mactracker to identify their Mac model (right). Not sure which Mac you own or how much RAM or free drive space it has? Choose About This Mac from the Apple Menu, and then click More Info. In Lion, the resulting window displays your computer model and year/version; click the Storage tab to view your drive’s free space, and click Memory to check its RAM amount. In Snow Leopard, you get a System Profiler window—select Memory to check the RAM amount; select Serial-ATA, and then select your drive’s name on the right, to see your free drive space. Unfortunately, Snow Leopard’s System Profiler window doesn’t display your Mac’s actual model year/version. However, the excellent Mactracker (Mac App Store link) makes it easy to find this information. Just launch MacTracker and select This Mac on the left, and your Mac’s MacTracker entry—complete with its official model year/version—is displayed to the right. Finally, although it’s not a requirement, if you’ve got a desktop Mac, I highly recommend picking up Apple’s Magic Trackpad ( ) if you don’t already have one. The systemwide gestures introduced in Lion last year are only going to become more pervasive as OS X evolves, and you likely won’t enjoy the full benefits of Mountain Lion without a trackpad. (MacBook users, of course, all have a trackpad already.) I personally prefer a mouse or large trackball for general “mousing,” but I keep a Magic Trackpad within reach, as well, just to take advantage of OS X’s gesture-based features. I call it my Magic Gesturepad. While Apple describes the process of upgrading to Mountain Lion as a simple download and install, those of us who’ve been doing this for a while know that a major OS update is never that simple. Perform the following tasks before the upgrade and you’ll have a much better chance of actually enjoying a pain-free experience. Make sure your Mac’s startup drive is in good health: To do so, open Disk Utility (in /Applications/Utilities), select your startup drive in the list on the left, click the First Aid tab to the right, and then click Verify. If Disk Utility finds problems, you’ll need to boot from a different volume to perform the actual repairs using the Repair Disk button. If you’re upgrading from Lion and your Mac can use Lion Recovery (known in Mountain Lion as OS X Recovery), you can boot into recovery mode (by holding down Command+R at startup) and use Disk Utility from there; alternatively, if you created a bootable Lion-install drive for older Macs or for newer Macs, or created a separate Recovery drive, you can boot from that drive and use Disk Utility. If you’re upgrading from Snow Leopard, you can use Disk Utility when booted from either your Snow Leopard Install DVD or the OS X install DVD or thumb drive that shipped with your Mac. If you’re feeling especially cautious, you can also opt to run Apple Hardware Test. 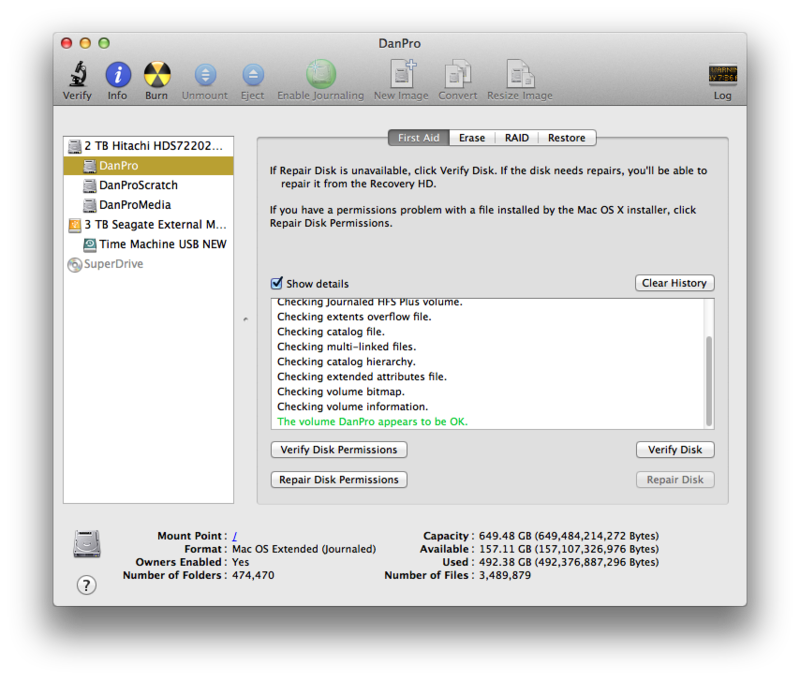 Disk Utility can verify that your Mac's drive is healthy. Back up your Mac, and test that backup: Let me say that again: Back up your Mac, and test that backup—before installing Mountain Lion. 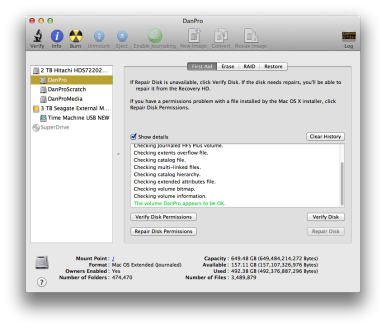 (See our article on Mac backup plans for more info on backing up your Mac.) I personally recommend creating a bootable-clone backup (using SuperDuper or Carbon Copy Cloner) for the task, although a Time Machine backup will do, as well. To test a clone or other bootable backup, use the Startup Disk pane of System Preferences to boot from the backup drive. To test a Time Machine or other non-bootable backup, try restoring several files—both older ones and newer ones—to make sure you can recover your data should disaster strike. Disable third-party disk encryption: If you’re using third-party full-disk encryption software, you may want to temporarily disable that encryption before upgrading your Mac’s OS. Most of these products interact with your drive and the OS at a low level, and an incompatibility with Mountain Lion could leave you unable to boot your Mac or, worse, unable to access your data at all. Once Mountain Lion is up and running and you’ve verified (with the developer) that your encryption software is compatible, you can re-enable encryption. However, given that FileVault 2 also encrypts your entire drive, you might consider this an opportunity to migrate to FileVault 2. Run Software Update: To be sure you’re running both the latest version of Mac OS X—version 10.6.8, for example, includes fixes to Snow Leopard that are required for upgrading to Mountain Lion—and the latest versions of any other Apple software that might be affected by the upgrade, you should run Software Update (from the Apple menu). You should also check for updated firmware for your particular Mac model. Check for Mountain Lion-compatible updates to third-party software: As with any major upgrade to Mac OS X, you’ll likely find that some of your third-party software needs to be updated to work with Mountain Lion. If you take some time to check compatibility before installing OS X 10.8, you’ll be in a position to get up and running immediately, rather than being frustrated by your favorite apps and add-ons not working. If an app has an update available, you’ll want to download and install that update. For apps you’ve obtained via the Mac App Store, this is as simple as launching the App Store app, clicking the Updates button in the toolbar, clicking Update All, and providing your Apple ID and password when prompted—this will download and install all available updates at once. For non-Mac App Store apps, you’ll need to manually install updates. Some apps provide a built-in update feature (often accessed by choosing Check For Updates from the application’s Application Name menu or its Help menu); for those that don’t, you’ll need to visit the developer’s website. The biggest offenders here—in terms of being incompatible with Mountain Lion—will be programs and system add-ons that integrate with (or hack) OS X at a low level. Kernel extensions, for example, are notorious for being incompatible with major new versions of OS X, but you may also find that utilities that tweak the Finder, add-ons that enhance Mail, and other plug-ins and “enhancers” won’t work under Mountain Lion, even if they worked fine under Lion. (This will be a bigger issue for people upgrading from Snow Leopard.) So be sure to check vendor websites for OS X 10.8-compatible updates for your favorite software before upgrading. (Don’t forget to check third-party System Preferences panes and Mail add-ons.) If it turns out that a particular bit of software is incompatible with Mountain Lion and doesn’t have an update available, uninstall or disable it until a compatible version is released. Snow Leopard users only: A bigger issue may be older Mac software that hasn’t been updated recently—you may find that it doesn’t work at all under Mountain Lion. Specifically, PowerPC programs—software that was never updated to run natively on Macs with Intel processors—won’t work at all under Lion or Mountain Lion. Under previous versions of Mac OS X, Apple provided software called Rosetta that allowed PowerPC code to run on Intel Macs. In Snow Leopard (OS X 10.6), Rosetta was no longer installed by default, but the OS would offer to download and install Rosetta if you tried to run a PowerPC program. However, Apple killed Rosetta completely when Lion was released, and it remains unavailable in Mountain Lion. If you’ve got important PowerPC programs (for example, older versions of Quicken for Mac are still surprisingly popular), you’ll want to update those programs to Intel-processor versions, if available, before upgrading to Mountain Lion. If such updates aren’t available, you should find acceptable alternatives, whether those are modern Mac alternatives or, if need be, Windows versions that you can run under Boot Camp or virtualization software such as Parallels or Fusion. (See my colleague Christopher Breen’s series of articles on Lion and PowerPC software.) Alternatively, you could keep an old Mac on hand to run those apps when needed. Should you do a "clean install" of Mountain Lion?